Do you need any arguments that Tom Hanks is one of the most accomplished1 and successful actors around? Consider this; he has a winning streak2 of 10 consecutive3 movies he has starred in that have grossed4 over $100 domestically5 in the US. That’s a record. Remember The Green Mile, Toy Story and Toy Story 2, Saving Private Ryan, You’ve Got Mail, Apollo 13, Forrest Gump, Philadelphia, Sleepless in Seattle, A League of Their Own, and Cast Away? If that wasn’t enough, how about his two Oscars for Best Actor? Even among A-list6 actors, he tops the list. Thomas J. Hanks was born July 9th, 1956, in Concord, California. Tom and his elder siblings7 were raised by their father Amos Hanks, following the divorce8 of their parents. Because Amos Hanks was a chef9, it forced his family to move every six months in pursuit of jobs. This unstable upbringing meant many schools for young Tom, who had to readjust10 to his new surroundings practically every semester. Initially a shy schoolboy, Hanks dealt with these readjustments by becoming the class clown and taking on different personas – almost considered11 practice for his career. He took these “characters” to the stage and he began participating in high school plays. While a student at Chabot Junior College, he saw a production of The Iceman Cometh for a class, which convinced12 him that he wanted to become an actor. He transferred13 to California State University in Sacramento as a theatre major14, and was recruited15 by the Great Lakes Shakespeare Festival in Ohio after his outstanding16 school performance in Cherry Orchard. After three years of experience with the Shakespeare festival, Hanks headed to the Big Apple17 with big dreams. Going through the requisite18 auditions before hitting it big19, Hanks finally landed20 his debut role in 1980, in the film He Knows You’re Alone. He then landed a role in the drag21 ABC comedy, Bosom Buddies, a role which forced him to wear dresses and heels for two seasons. Following that stint22, Hanks did the rounds23 on popular ‘80s sitcoms24 such as Family Ties, Taxi and Happy Days, which led to his role in Splash. Director Ron Howard tapped25 Hanks to audition for the supporting role in Splash (1984), and he landed the lead26. The mermaid27 romance made waves, but Hanks was headed for calm waters with his next movies, such as Bachelor Party [Мальчишник] (1984), Volunteers (1985) (where he met his wife, Rita Wilson), The Money Pit [Прорва] (1986), Nothing In Common (1986), and Dragnet [Сети зла] (1986). But he hit it Big with the 1988 comedy about a teenager trapped28 in a man’s body. Finally, in 1993, Hanks became an A-list actor and an Oscar favorite. Apparently forgiven for career choices such as The Bonfire of the Vanities (1990) and Turner and Hooch (1989) (his role in A League of Their Own made up for these), Hanks won the hearts of women in Sleepless in Seattle (1993), reuniting him with his Joe Versus the Volcano co-star, Meg Ryan, and the hearts of everyone as an AIDS29 victim in Philadelphia (1993). He also won the Academy Award for Best Actor that year, and picked up the gold statue once again for his title role in Forrest Gump (1994) the following year. Ever since then, it was clear that everything Hanks touched turned to gold. In 1995, he went to the moon in Apollo 13 and lent his voice to cowboy doll Woody in Disney’s animated feature, Toy Story. He got back into the astronaut’s uniform for the made-for-TV miniseries, From the Earth to the Moon (which he also directed and produced); re-teamed with his Sleepless co-star for the romantic comedy You’ve Got Mail [Вам письмо] (1998), and returned as the optimistic Woody for the hit Toy Story 2 (1999). On a more serious note, Hanks starred as Captain John H. Miller in Spielberg’s Saving Private Ryan (1998), and as a prison guard30 in The Green Mile (1999), both of which garnered31 Hanks Best Actor Oscar nominations. Hanks has proved that his talent is truly multi-faceted32: as a regular host on Saturday Night Live33, he has proved his comedic side, while as director of features such as 1996’s That Thing You Do! (which he also wrote the script for) and the television miniseries Band of Brothers, and producer of a bevy34 of features (most notably 2000’s Cast Away [Изгой]), Hanks has mastered every angle of filmmaking. 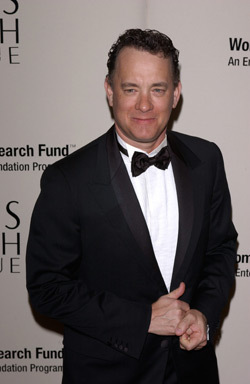 Also a family man, Hanks is happily married to Rita Wilson, with whom he has two children. He has another two children with his ex-wife, Samantha Lewes. One of the most respected and likable men in Hollywood (and the only actor worthy of a $20 million salary, according to Entertainment Weekly), more of Hanks stellar35 performances can also be seen in Cast Away, Road To Perdition [Проклятый путь] (2002), The Terminal (2004), and The Da Vinci Code (2006). In 2007, Hanks starred in Mike Nichols’ film Charlie Wilson’s War in which he plays Democratic Texas Congressman Charles Wilson. A film adaptation of Angels & Demons, the prequel36 to The Da Vinci Code, had been announced, and in April, 2007 it was revealed that Hanks was going to reprise his role as Robert Langdon and that he would reportedly37 receive the highest salary ever for an actor.